Here are some facts about Jackson Pollock, the American artist. Jackson Pollock was born on 28th January 1912 in Cody, Wyoming in the United States. His father, LeRoy Pollock, was a government land surveyor and Jackson used to go on surveying trips with him. On these trips, they enjoyed learning about Native American culture. Jackson Pollock wasn’t a very good pupil at school. He got expelled from two high schools and in 1930 he decided to live with his brother in New York. He studied at the Art Students League where Thomas Hart Benson was his tutor. Jackson Pollock’s work wasn’t created in the traditional ways with the traditional painter’s tools. 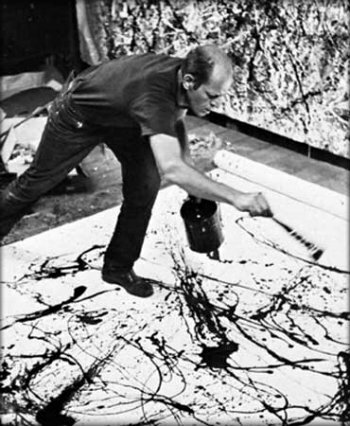 Instead of using a brush and an easel, Pollock placed his canvases on the floor and used sticks, dripping fluid, sand and knives to add paint. He used flinging, dripping, pouring and splattering techniques, using the movements of his whole body to control the flow of the paint. 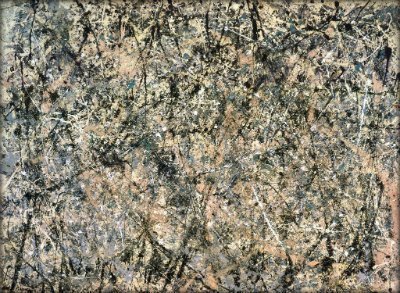 Pollock stopped naming his pictures (giving them numbers instead) because he didn’t want people to look for a subject matter or a meaning in his art. Instead he wanted the appreciate the painting for what it was. Jackson Pollock died on 11th August 1956, aged 44. He crashed his car while drink driving. He is buried in the Green River Cemetery in Springs, New York. A large boulder marks his final resting place. In 2000, Ed Harris directed and stared in Pollock, a film about Pollock’s life. Jackson Pollock’s paintings sell for millions of dollars. No. 5, 1948, for example, sold for $140 million in 2006. What next? Find out about other important artists by visiting our Famous Artists resources page.